The song Su nkwa is one of my favorite Ghanaian standards. Meaning "cry for life" in the twi language, the meditative vocals in the song have always appealed to me as they have an emotional urgency that is open and spacey. I find it captivating and have always looked for versions of the song. The first version that knocked me out was by Atakora Manu on a sterns release. This version is by song writer and vocalist Baffour Kyei, who was born in Kumasi or Banso in the Ashanti region of Ghana in 1947. He started out his career with the Ashanti Police Band and then formed the Great Africans Band where he had his first singles Phelomina and Awadee Tese Ahwehwe. He also wrote the popular song Adjoa Abene and became known as "Mr. Adjoa Abene". He also performed with B.B. Collins and the Powerful Believers, Atakora Manu, and the Kyeremateng Stars. 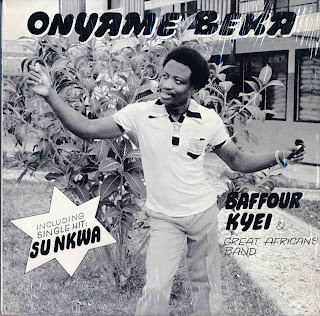 At some point, Baffour Kyei moved to England and did a number of releases. The vocals start to soar right away and play off beautifully with the horn playing by Brother Quashie. The great Eric Agyeman is on the lead and rhythm guitar. I hope you like the song. Every track you post is right up on my alley! This one is no exeption. Thanks!